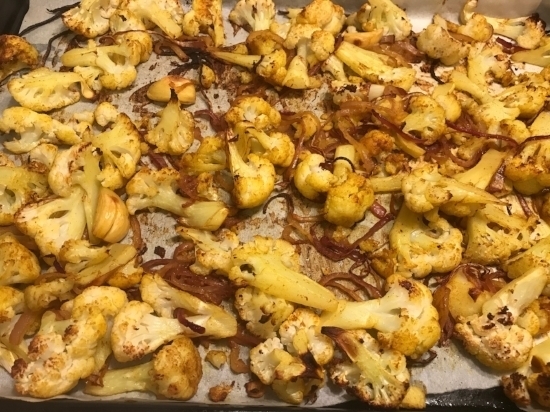 Making a double batch of roasted cauliflower that can be served at 3 meals with a different presentation each time saves us some time and gets us out of a rut. Night one can be a simple side dish of roasted cauliflower. However with some unique spices, it doesn't have to be bland! Night two use leftover cauliflower as part of a salad. This salad is beautiful and so nutritious with lots of different flavors. That is where the extra roasted cauliflower can come in handy! This salad has a few steps so having the cauliflower done is a bonus. Click here for the recipe. Lastly, for night three (or as part of a great lunch) soup is amazingly easy to make with leftover roasted cauliflower. Modify the recipe as needed depending on how much leftover veggies you have. Cauliflower chopped into uniform pieces mixed with red onion, olive oil, cumin and turmeric makes for a great side dish for night one. Add 3 (whole slightly smashed) garlic cloves per tray of veggies (reserve for the soup recipe on the last night). Step Two: Use leftover Cauliflower from Night one to add to salad for dinner tonight! Although the salad recipe doesn't call for turmeric to be added to the cauliflower, it does call for it in the soup recipe so I just add it when roasting the initial batch of cauliflower. Tumeric contains curcumin a polyphenol with antioxidant and anti inflammatory properties. This salad calls for parsley as a green. Its a great source of Vitamins A, C and K, folate and Iron. Give the parsley a try either as the sole green for the salad or in addition to other greens. I like using a variety of greens especially when you can use up what you have on hand. I love arugula, mixed greens and different varieties of kale in addition to the parsley. The healthy plant based fats in the tahini dressing helps our body absorb the fat soluble vitamins found in the greens. Tahini (basically ground sesame seeds) gives a unique flavor to the salad. Sesame seeds are a good source calcium and magnesium. The dressing is quickly made in a blender or food processor with tahini, garlic, water, lemon juice and spices. If you don't like the heat, go easy on the cayenne pepper and add to taste. Can of chickpeas drained and rinsed with some garlic powder smoked paprika, cayenne pepper and I added some chili powder as well. Saute' 5 minutes in a skillet with olive oil and add to the salad. A great source of soluble fiber to help with cholesterol lowering! Step Three: Use leftover cauliflower to make a flavorful soup. I promise you the soup has very few steps and having the cauliflower already made, makes it a snap to get cauliflower in a different way. Basically chop onion or combo of onion, leek and celery, soften in a stock pot (5 minutes or less) with olive oil and the add vegetable or chicken stock and the leftover cauliflower, simmer 15 minutes and puree. Don't worry about making the recipe exactly as it says. The recipe only calls for chopped onion but I love to add celery and the white part of a leek. After I made the salad the night before, I put the leftover cauliflower and chickpeas in one container in the frig. I wasn't then going to then pick out the chickpeas so...I added them all the leftovers to the soup. I left out the coconut milk since the chickpeas thickened it nicely. A little cilantro and cashews made a nice garnish for the soup. Click here for the recipe. I love the variety of flavors and textures you can get from the same vegetable. I hope you do too!